From Peter F. Hamilton comes the second novel in the Night's Dawn trilogy, an extraordinary feat of storytelling on a truly epic scale. The ancient menace has finally escaped from Lalonde, shattering the Confederation's peaceful existence. Those who succumbed to it have acquired godlike powers but now follow a far-from-divine gospel as they advance inexorably from world to world. On planets and asteroids, individuals battle for survival against the strange and brutal forces unleashed upon the universe. Governments teeter on the brink of anarchy, the Confederation Navy is dangerously over-stretched, and a dark messiah prepares to invoke his own version of the final Night. In such desperate times the last thing the galaxy needs is a new and terrifyingly powerful weapon. 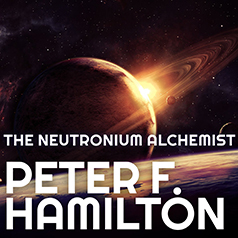 Yet Dr. Alkad Mzu is determined to retrieve the Alchemist so that she can complete her thirty-year-old vendetta to slay a star. This means that Joshua Calvert has to find Dr. Mzu and bring her back before the Alchemist can be reactivated. But he's not alone in the chase, and there are people on both sides who have their own ideas about how to use the ultimate doomsday device.